The British are the least likely Europeans to consider themselves European. That’s according to data from the Spring 2015 Eurobarometer report, which we spotted in a Morgan Stanley research note back in April. 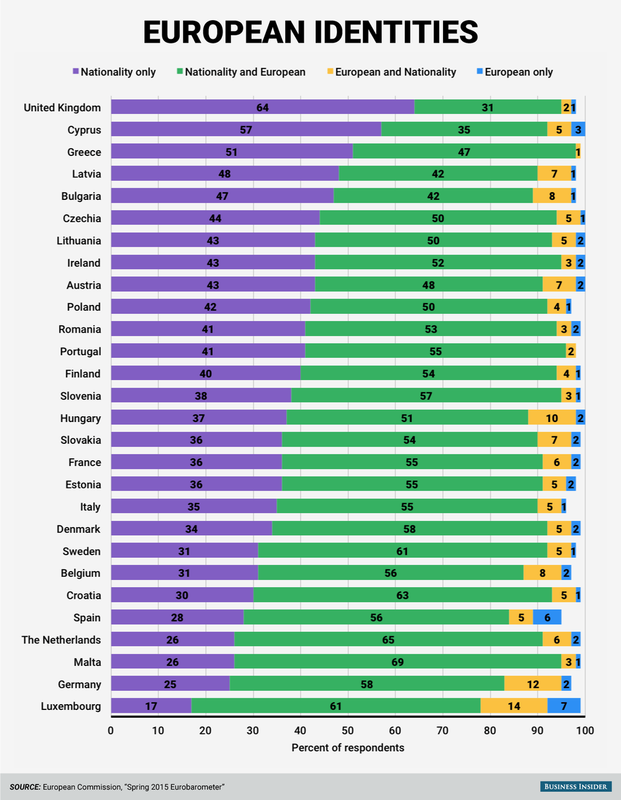 The Eurobaromater report, published by the European Commission, surveyed Europeans to see how they understood concepts of European citizenship and identity. One of the most interesting questions in the report focused on how European citizens viewed their relationships to their home nations and to Europe as a whole, asking whether they identified themselves only by their nationality, by nationality and then as European, as European and then by their nationality, or just as European. Overall, British respondents were the most likely to identify themselves only by nationality, at 64%. And so, although this data is from last year, it’s quite interesting in light of the UK’s recent vote to exit the EU. Citizens from Cyprus (57%), Greece (51%), and Latvia (48%) were also highly likely to identify themselves only by nationality. On the flip side, Luxembourgers were the least likely to identify themselves only by nationality (17%), followed closely by then Germans (25%). Residents of these countries were much more likely to at least partially embrace a European identity. Check out the Eurobarometer data below. It’s pretty interesting.